If you want to view it as a web page, click here. Here’s a scientific breakthrough – our present for all the bloggers and readers out there. Inspired by our friends at NASA, who announced the finding of a new black hole, we published a new cosmic discovery, where you can find out more about which are the blogging planets, which ones orbit only part of the galaxy, and the planets close by. We guarantee you won’t get lost. You might actually (re)discover yourself. Have a happy BuySellAds year! 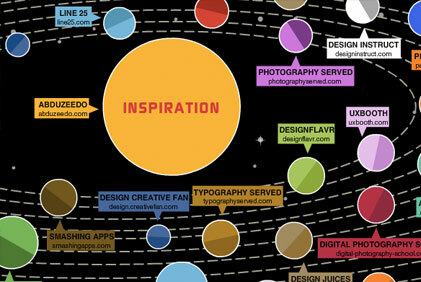 Check out The Design Galaxy. Last time we told you about a new framework for integrating Mac applications with BSA. Now it’s time to introduce the iOS version of the framework for the iPhone and iPad. We’d love to hear your feedback. Please feel free to contact us with questions, comments, or to show off your BSA infused creation. Kiwi2 just launched on the 24th of November as the second Mac OS app using the BSA framework (after AppBodega). Kiwi is a Mac Twitter client featuring a ton of advanced features such as multiple tabs, filtering, themes, and inline images. It is part of our design/devAdPack, while AppBodega ads can be purchased on BSA. This autumn Todd did a lot of interviews. Here are two of the latest: he answered questions for… Royal Thoughts, a smart site filled with thoughts from industry experts on marketing, advertising, and design. And here is the chat about online advertising he had with Nick Goggans of 20onfive.com – inspiring site that invites media innovators to sit down for a 20 minute conversation on topics surrounding media including advertising, analytics, innovation, startups, and communication. You probably read about iOS Ad Framework on Webmaster-Source, and about the “shining beacon amongst the numerous online advertisement networks” in this smart piece – The Ads Marketplace Review, on TechNama. Also, our classy Adpacks.com has been featured in this cool showcase of creative designs published in Smashing Magazine. 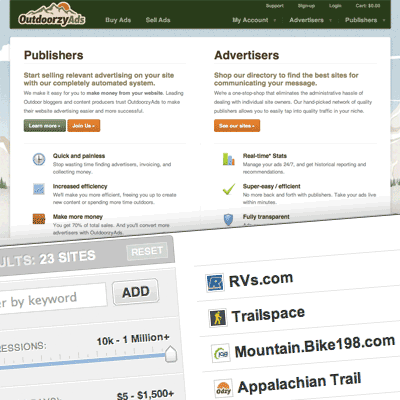 We’re excited to announce OutdoorzyAds.com, the most recent BSA Private Label to launch. We sure hope you enjoyed this newsletter! Feel free to email any comments to Matthew. Since our last newsletter we have answered 2,890 support tickets, 6,714 new members registered, 5,600 new sites added, 838 approved, 3,987 ads purchased, and 6.5 billion impressions served. Amazing! These are just a few of our newcomers. Check our second AdPack, the User Experience pack! In November we were in a The WordPress Blogger Bundle. AppBodega has been around for a while. They are a Mac Catalog/Store for finding, buying, and updating your Mac Applications. You can unsubscribe email gallery at any time. Click here.